Hey, It's Not A Burglar, It's A 19-Foot Python : The Two-Way The ransacking of a charity store in Australia by a suspected burglar with a bad case of stomach flu had investigators puzzled — until a store employee discovered the 37-pound culprit. 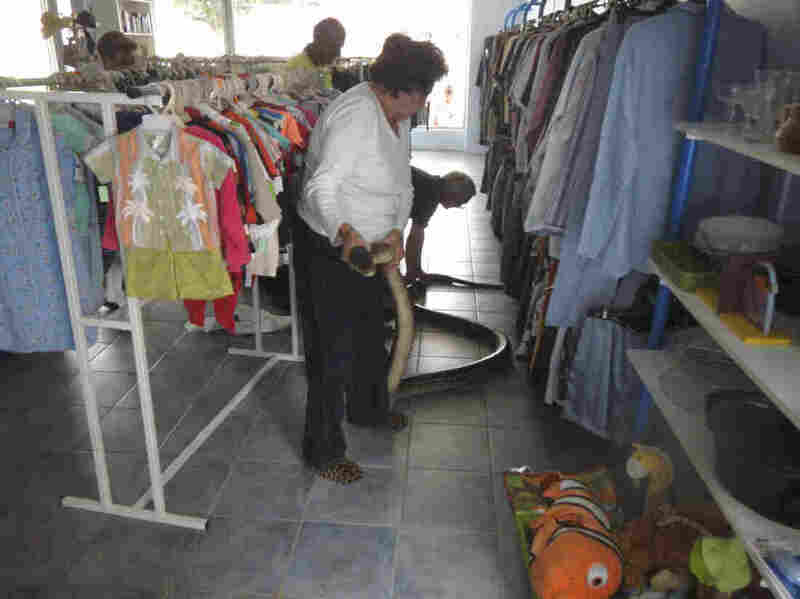 Employees hold a huge python caught in an Australian charity store. Police initially thought a burglar had fallen through the roof and made a mess. Imagine this: A 19-foot python falls out of the ceiling of a store and leaves a big hole, knocks over sale objects and then makes a nasty mess on the floor before hiding in plain sight along a wall. And nobody finds it for a day. Police in Queensland, Australia, were called to a charity store in the tiny town of Ingham this week to investigate what they initially suspected was a break-in by someone with stomach flu. "We thought a person had fallen through the ceiling because the roof panel was cut in half," police Sgt. Don Auld told The Associated Press. "When they've hit the floor, they've vomited and then staggered and fallen over. That's what we thought anyway." But nothing had been stolen from the St. Vincent de Paul store. And although there was a hole in the ceiling, there was no damage to the outside roof, which further puzzled authorities. The mystery was solved a day later, when a store employee found the hulking python lying innocently along a store wall underneath a clothes rack. Police suspect the snake could have first hidden in the store's roof, which had been damaged when a tropical storm blew through two years ago. As for the nonexistent burglar's stomach issues, The Cairns Post reports that the mess turned out to be snake urine and feces. A local snake handler was called in to remove the 37-pound python, which was later released into local wetlands. The Post says it wasn't handcuffed "for logistical reasons."